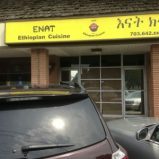 We knew Enat Ethiopian Restaurant in Alexandria, VA, promised to be an excellent and authentic Ethiopian restaurant when we walked in and did not see another white face in the crowded room other than our own. Enat didn’t disappoint. The room has the ambiance of a family sports bar. A wide screen TV is fitted against a large wall; a soccer game was on when we first visited. Families were situated around the tables with linen tablecloths covered with glass and many eyes were glued to the screen. As you walk in you will see a large granite bar with a young bartender expertly mixing drinks. Well behaved children shared bites of Wat with injera on a communal plate with the rest of their family. Relaxation and comfort is the name of the game here. You see businessmen in suits and others in shorts, t-shirts, jeans and sneakers.